I know, mud? I couldn't come up with something else? Probably, but they sure do know what I am talking about when we talk about mud. So this week was brown. We have lots of brown. Brown was everywhere so it was very easy to have many different things to show them; windowsills, doors, chairs, teddy bears, blocks, etc. They were really good at finding it. Our color book consisted of a brown acorn and then our manipulative page was Spot the dog. We had to glue brown dots onto Spot. 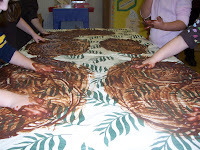 Our big experience with the color was the chocolate pudding play. If you are a neat person--do not attempt this. I forewarned my aide, and I even asked for parent volunteer to be in the class with us. So first we all made the pudding together--I learned my lesson from the blue. 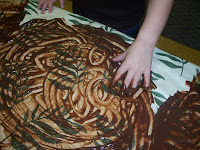 We got to see the light brown powder, and smell that great chocolate smell. Then we added the milk and everybody helped stir. Wow, even though we put in white milk, the brown got a lot darker. Finally I used three different tables with no more than 5 children at each table and one adult at each table. Then each person got a "glob" and they were good to go. Well for about the first couple minutes, the only thing that touched that stuff was the tip of the pointer finger. Then I said taste it, so the finger got a little deeper. Then I asked if they could draw something in it--and we were off. There was one little girl that would rub it all around, then rub her entire face, like she was washing herself. Clean up took us a little while. I had buckets by the table and we called one child at a time--leaving the messiest for last. We only had to change one shirt. 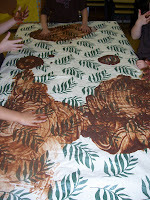 Cleaning the table cloths was quite a task though. We had a great time with out brown, but if you try this, be ready. Brown is our color for this month. I'm not sure I'm brave enough for the pudding, however! I can already see a couple of my girls who love to get paint up to their elbows and everywhere else. Oh, they'd love that!